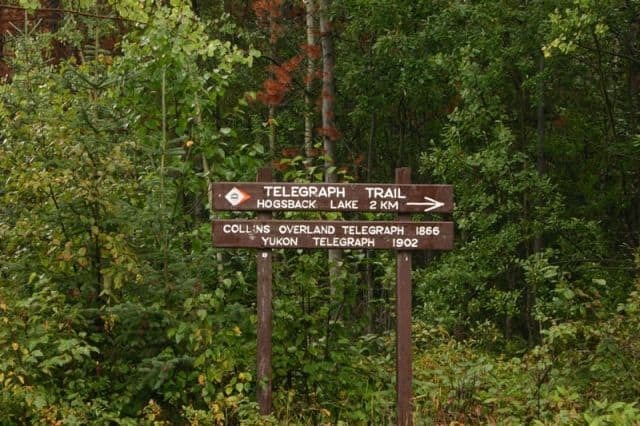 The 1870's Telegraph Wilderness Trail in Vanderhoof, British Columbia, Canada is a historic trek following the same route travelled by many pioneers and settlers when laying down the Collin's Overland Telegraph Line linking North America to Europe. Soon later the line became the Yukon Telegraph and the trail became one of the first transportation routes in the region to access the Nechako Valley. 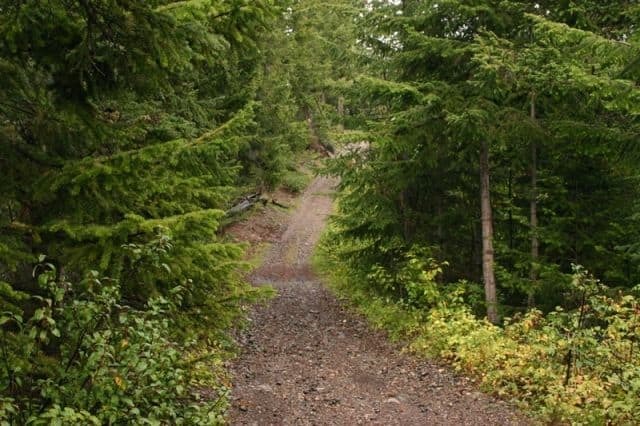 The Telegraph Trail is a hiking, mountain biking and horseback riding route following a mainly loose gravel trail deep into the backcountry wilderness regions near Mapes which is located south of Vanderhoof, British Columbia, Canada. The one-way hike is about 10 kilometres long (20 Kms return) and starts near Hogsback Lake. The route is considered to be moderately difficult with some steep hiking sections plus it is a long distance to cover. The adventure route eventually hooks up to Blackwater Road on the other end. Some leave a car at both ends and do the trail one way. Others decide to do some camping at one of the wilderness backpacking campsites located on the historical trail. The adventure trail is very well marked with diamond shaped "Telegraph Trail" tree markers leading the way. The trailhead of the "Telegraph Trail" is located near the south end of Hogsback Lake. One must drive through the recreational campground first. 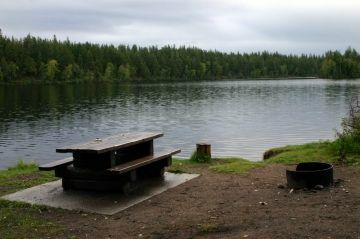 The campground is a lakefront recreation wilderness site. The access road to the southend of the campground is a bit rough going, on a high ridge and driving over big tree roots - so those campsites are mostly designated for truck campers and tenters. The first section of the recreational campground on Hogsback Lake should be able to accommodate small RVs. The campground is a great base camp for those wanting to hike some history exploring the Telegrapgh Trail. At the trailhead there are some amenities available for hikers and campers like pit toilets, picnic tables, a boat ramp and fire pits. How to Get Here: From the community of Vanderhoof BC travel south on the Kenney Dam Road until you reach a fork in the road. At the fork in the road stay left and you should now be driving on Sinkut Lake Road. Stay right at the next fork in the road therefore turning onto Blackwater Road. Continue driving Blackwater Road to Hogsback Lake for about 8 Kms (5 mi.). Follow the signs to the lake. Drive through the campground following the road up onto a ridge overlooking the lake and then back down to the more campsites and the trailhead.